Lucy's father, Francis, died in 2011 in Pennsylvania, far away from home in the Willamette Valley, Oregon. How was he to be remembered? Family members from children to great-grandchildren scattered his ashes in a cemetery in Corvallis, OR; on the family farm in Philomath, OR; on a lake he loved in Ontario; and in the surf of the Pacific Ocean at Manzanita, OR. They planted a memorial maple tree on the farm. They shared memories. Beyond that, Francis himself provided a unique and treasured memento. For many years, he'd cultivated a particularly lovely azalea in his garden in Salem, OR. After the death of his wife, whom he survived, Francis gently dug up and potted the azalea and gave it to his daughter. That took forethought on his part. On her part, she took it home to DuPont, WA and lovingly planted it in her garden. Despite regular cultivation, fertilizing and pruning, the azalea sulked there, losing twigs year after year. 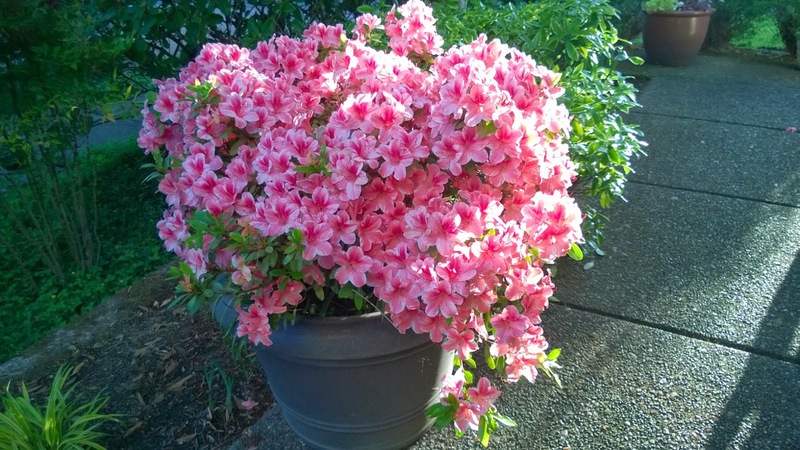 In 2013, Lucy repotted the azalea and moved it to her new home in NW Portland, OR. Here, in Francis' and his plant's home climate zone, the azalea truly has truly come back to life. This April-May, 2014 it's just gushing with vitality and exudes energy. See that for yourself in the photo. Now the plan reminds us, not of Francis' death, but of his sunny outlook on life following death and his joys during his long life. I've learned a lesson. To remember a relative, you may want to request a favorite perennial plant. Along with photos and other mementos, the plant may give years of annual memories of your loved one's life and loves.